4 Bedroom Detached House For Sale in Windsor for Price on Application. Set behind a timber gate, a very well presented detached 4-5 bedroom, 2 bathroom family home including a studio annexe with it's own separate entrance. 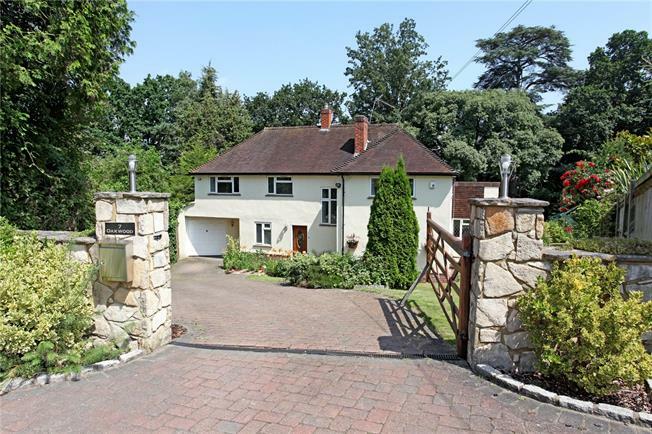 Oakwood is located on a beautiful secluded plot of approx a third of an acre, on the desirable and private Pelling Hill. Ground floor accommodation includes a sitting room with french doors to the garden, and a front aspect dining room with a snug in between, providing a versatile and open plan living arrangement. In addition a striking kitchen/breakfast room has doors opening onto a terrace overlooking the rear garden. The kitchen is well appointed with cream units, granite worksurfaces and includes a utility area whilst a study and cloakroom complete the arrangement for the ground floor. The first floor landing leads to the master bedroom and ensuite bathroom, bedroom 2 and 3 both with dual aspect views, bedroom 4 and main family bathroom. Situated in a highly desirable private residential location in Old Windsor, close to local shopping facilities with larger towns of Windsor and Staines approximately four miles in either direction. The historic site of Runnymede is close by and provides delightful rural walks and access to the River Thames. For the commuter there are two train stations serving London Paddington (via Slough) and London Waterloo (mainline approx 50 mins). An excellent range of well-regarded schools are available in both the independent and state sectors, including St George's, Upton House, Brigidine, Eton College, St John's Beaumont, Kings Court Primary, St Peters Middle School and Windsor Boys' and Girls' Secondary Schools. In addition, there are also school coach services from Old Windsor to St George’s Weybridge, Sir William Perkins School, Chertsey, Hampton School for boys and The Lady Eleanor Holles School for girls, (both in Hampton). Oakwood is approached via a timber gate with a paved driveway leading to the garage. To the rear, beautifully landscaped gardens wrap around the property and includes a full width raised terrace, a greenhouse and a considerable timber shed with pitched tiled roof. An integrated studio annexe has it's own external entrance in addition to an internal door and enjoys rear views of the garden. Accommodation comprises a fully fitted kitchen with a built in oven and space for both a dishwasher and washing machine, together with a shower room and sitting room/bedroom with french doors leading to a rear terrace.